Your kiddo will be ready to fight for the birth of a nation with this American Patriot Costume for boys. General Washington will have wished he had a comrade as loyal and brave as your little one. Redcoats will be thankful they didn’t have to fight a soldier as skillful and fearless as him. Your youngster will have freedom on his mind and red, white, and blue pumping through his veins! 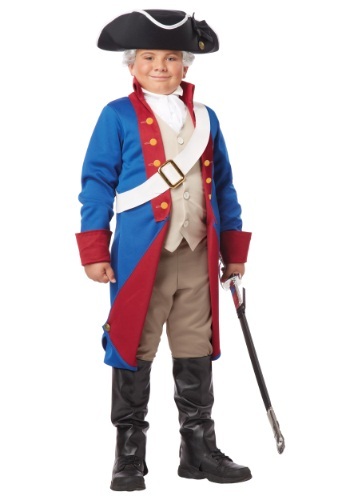 Whether Halloween is right around the corner or a Revolutionary War reenactment is coming up, this American Patriot Costume will be perfect. Your little history buff will look as if he's somehow traveled to our time from the late1700’s, once he tosses on this old-timey uniform. The combined jacket and vest look like something right out of a history book, especially once you add the white cravat. In order to complete this historic transformation, your kiddo will need a few accessories. Start with a proper pair of slacks to wear with the guise, then look through our tricorne hats, and a maybe even grab a colonial wig to act as the cherry atop this amazing costume! Oh, and not that we condone violence or anything (maybe the occasional Nerf War here and there) but your little one will definitely need a weapon to carry around with this costume. After all, it is based on a military outfit during a time of war. So, take a look at our collection of toy swords and guns to find the perfect weaponry for your kiddo to reenact his favorite historical events!